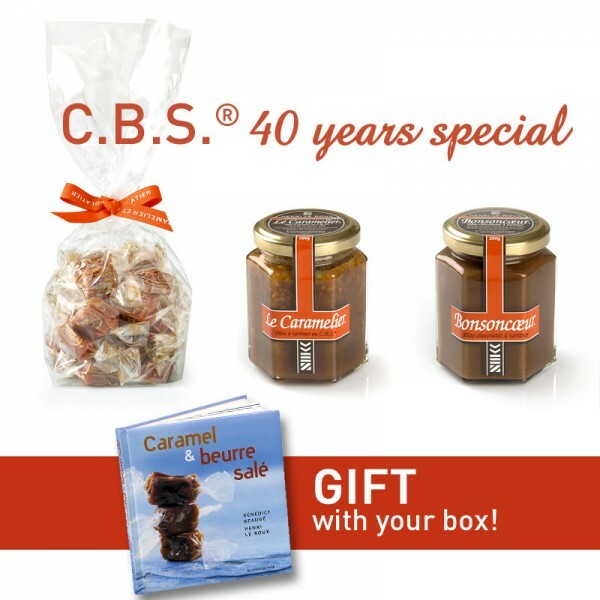 This year, our C.B.S.® celebrates its 40 years! To (re)discover it, enjoy our Salted Butter Caramel special box that contains: 1 C.B.S.® 200g-pack + 1 Caramélier® 200g pot + 1 Bonsoncœur® 200g pot plus the book Caramel & beurre salé (French only) as a GIFT with the special box! A caramel which challenges the time since its creation in 1977. A pleasant association of Breton salted butter for the softness, Valencia almonds for the character, hazelnuts of Piemont for subtle crisp and walnut from Dauphiné for the unctuousness. A fine chocolate spread whose harmony results from a delicate dosage of the chocolate, dough of hazelnut, flower of salt of Guérande and from the brown sugar. BUTTER, sugar, CREAM, glucose syrup, LACTOSE, fruits pulp (sugar, pineapple, apple, strawberry, cherry, raspberry, passion, lime, pear), fruits juices (orange, lemon, lime, yuzu), fruits (cranberries, lemon, strawberry, banana, pineapple, cherry, pear, strawberry), buckwheat, cocoa, cocoa butter, candied orange, MILK, tea, inverted sugar, HAZELNUT, SESAME, SESAME paste, ALMOND, coffee, salt, ginger, lemon zests, NUT, spices, gellant: pectin E440i, rum, chocolate (cocoa bean, sugar, cocoa butter, emulsifier: SOYA lecithin, natural vanilla extract), antioxidant: citric acid E330, colourants: (E124, E141i, E141), essential oil of sweet orange.